A year later, Seaver signed with the New York Mets following a convoluted mess. The Atlanta Braves had selected him in the first round of the June amateur draft. Baseball Commissioner Spike Eckert, though, ruled the contract null and void. Seaver signed the deal after USC had played a couple of exhibition games, Eckert pointed out. That violated Major League rules even though Seaver didn’t pitch in any of those games. The Mets won Seaver’s rights in a draft lottery held soon afterward. The power pitcher with the distinct drop-and-drive delivery compiled a 311-205 won-loss record in a 20-year big league career (most memorably with the Mets, but also with the Cincinnati Reds, Chicago White Sox and the Boston Red Sox). He posted a 2.86 ERA (127 ERA+), struck out 3,640 batters (sixth on the all-time list) and retired with three Cy Young awards. In 1992, the baseball writers elected Seaver to the Hall of Fame with 98.84 percent of the vote, the highest percentage in history. Happy birthday to “Tom Terrific,” born Nov. 17, 1944, in Fresno, Calif. 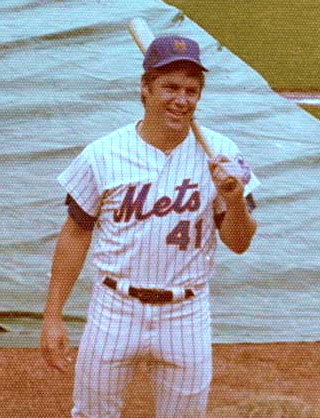 The following season, Seaver signed with the New York Mets after a convoluted mess. The Atlanta Braves had selected him in the first round, but Baseball Commissioner Spike Eckert ruled his contract null and void. Seaver had signed the deal while the USC season was going on. That violated Major League rules even though the pitcher had yet to play a game that year for the Trojans. The Mets won Seaver’s rights in a draft lottery. The power pitcher with the distinct drop-and-drive delivery compiled a 311-205 won-loss record in a 20-year big league career (with the Mets, Cincinnati Reds, Chicago White Sox and the Boston Red Sox). He posted a 2.86 ERA (127 ERA+), struck out 3,640 batters (sixth on the all-time list) and retired with three Cy Young awards. In 1992, the baseball writers elected Seaver to the Hall of Fame with 98.84 percent of the vote, the highest percentage in history.